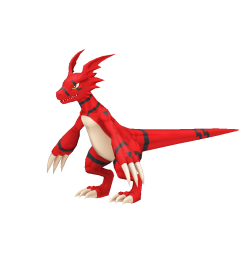 Guilmon X is an altered version of Guilmon that carries the X-Antibody Factor : Guilmon in its Digicore. Guilmon X is a Demon Dragon Digimon and carrier of the X Antibody, The engraved "Digital Hazard" mark has vanished. That is because it accepted and contained its power within its body. It still hasn't awakened to that power, but if it grows up the right way, it can be said that its qualities for maturing into a true guardian of the Digital World will have improved. Since its instincts as a Virus-species have also increased, its personality has become more aggressive, and it acquired its "Fire Mitt", a striking technique in which it covers its arms in its Special Move "Fireball" and strikes the enemy. Spews out a powerful flame shot. Fire Mitt Fire attribute 10 seconds cooldown 95 DS consumed 2 skill points per upgrade Learned at Lv. Punches the opponent using fists wrapped in fireballs.